If you've been living under a rock, you may not be aware that a goodly proportion of the costuming world is bewitched, befevered and bebothered about the upcoming 100th anniversary of the sinking of the Titanic. 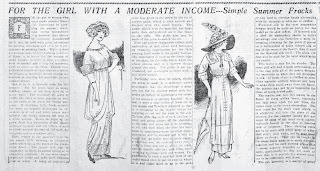 There are so many circa 1912 ball, tea, and travel ensembles underway that I am sure the fabric stores have noticed an uptick in sales of chiffon, satin, handkerchief linen and seed beads. I have not caught the disease and do not plan to; time's too precious this year. However, having spent a number of years in the Edwardian costume era, I've accumulated some construction resources that ought to help you when you start your designing and draping. 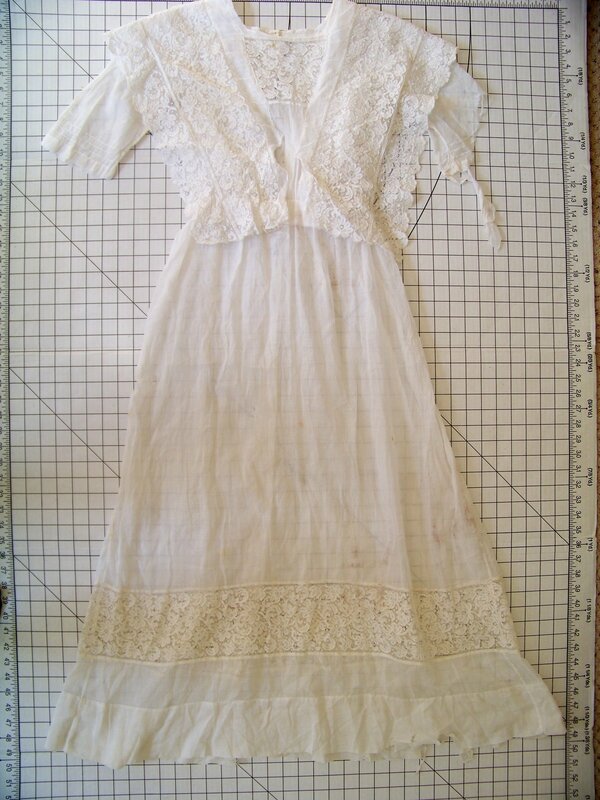 First, an extant garment, analyzed. I have an early teens era lingerie dress, in terrible condition, that I analyzed some years ago, specifically for the interior waist belt or waist band that is the linchpin of its construction, as are so many garments from this era. 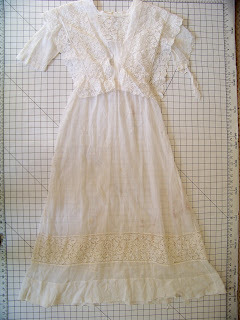 My post, Edwardian "Lingerie" Dress Diary, Part 6, contains an analysis, full of photos. It even shows how the bodice draping was attached to that waist belt! Thornton's International System of Ladies' Garment Cutting. 1912. Here you go! A go-to place for the pattern basics for 1912. Excellent for suits. I've drafted from here and the drafts work fine. Thank you, Costumer's Manifesto, for making this treasure available. The American garment cutter for women's garments. Gustav Engelmann. 1913. Pattern basics for 1913, but with some nice extras in the way of kimono cuts. From archive.org. The elements of dress pattern-making: Magyar dress-cutting for technical classes, home workers & professionals. Reeve, Amy J. 1912. A rather different way to approach cutting. From Cornell's HEARTH site. The Ladies Tailor, Vol. XXVII. No. 3. March 1911, London . Titanic-era suits! From the Costumer's Manifesto. This was the heyday of Home Economics, and there was a massive proliferation of dressmaking manuals, especially for schools. Some of them are very well written and include the minutest of details on draping and seams and dealing with the all-important waist belt. You will notice that school manuals did not keep up with high fashion; it would not make sense. Therefore, the dates of some of those I include are later than the Titanic, but their advice will still be useful. 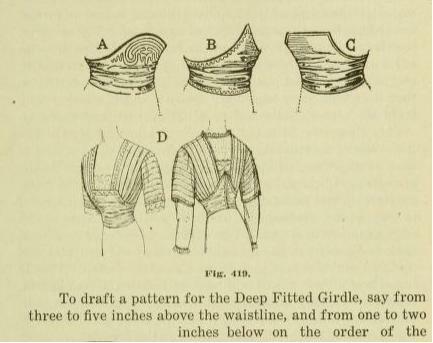 The American System of Dressmaking. Merwin, Pearl. 1912. If you read nothing else, read some of these 1000+ pages. This correspondence course includes draped bodices over fitted linings, kimono sleeve cuts, sashes, many of the details that you need. Lots of photographs and illustrations. The course was published in multiple editions, and some content dates to 1906 or so, but there is much that applies to 1912. From Archive.org. Dressmaking in the school. Cooke, J. C., Kidd, H. M. 1913. Great for details on fitting and on applying trims. The dressmaker: a complete book on all matters connected with sewing and dressmaking from the simplest stitches to the cutting, making altering, mending and caring for the clothes. Butterick. 1916. The classic kept being updated, year after year. There are still some early Edwardian images left in this 1916 edition, but it includes information on belting and hanging skirts, including circular skirts, that apply to the teens era. News reporting during the late Edwardian and teens era frequently included heavily illustrated, photo-rich "women's pages" with lengthy articles on fashions, millinery, hair dressing, ettiquette, and sometimes even tutorials. Chronicling America, from the Library of Congress, is STUFFED with such articles. I can't stress enough just how good a resource this is. You'd be nuts to miss it. 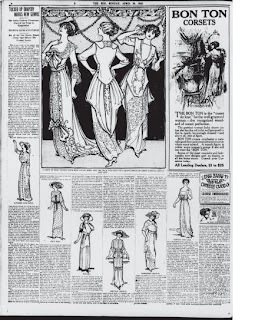 Take for example the article from the New York Sun, April 14, 1912, titled "Tucked Up Drapery Marks New Gowns". If you read it carefully, look at extant garments for comparison, and then use the pattern drafts for the basic dress or waist and skirt underneath the drapery, you can work out the fabrics, cuts, and additional drapings and trims on top. Use the keywords "fashion", "drapery", or other specific words to find appropriate articles. Dressmaker's Dictionary. Curtis, Homer S. 1916. Fabric names, explained :} From Archive.org. Edwardian-era content on my blog. Hairstyle information and more, almost always including the research sources I included. Thank you so much for sharing all of this! This is wonderful! I can't wait to sink my teeth into all this information! Oh, I am so glad. The Edwardian era is so full of documentation that it really eases the design and construction process. Of course, the gowns can be infernally complicated, but they are still fun. Thanks for sharing these, Natalie! What an exciting wealth of resources. It's always amazing how much easier research gets the closer in time to now one goes! Even the switch backward from Civil War era to 1830s was a massive change in research for me - there's WAY less. Then I made theoretical 10th century Norse (Viking) clothes, which put "limited source material" into a whole new context! By comparison, it's so luxurious studying anything in the 20th century....but a little overwhelming too! You are most welcome. Glad to make the research a little easier. You're right, there is so much material and even so many extant garments out there to purchase reasonably that sometimes it is almost too much. On the other hand, this wasn't the case even in 2008. Cornell's HEARTH resources were there, as was vintagesewing.info, but sometimes I had trouble understanding what the authors were talking about, and spent many hours consulting with the knowledgeable folks on Sense and Sensability about things like interior belts/bands. An Unseasonable Moment: Disturbing or Welcome?